This 1961 photos shows hot laboratory supervisor Bob Oldrieve uses manipulator arms to inspect materials inside a hot cell. 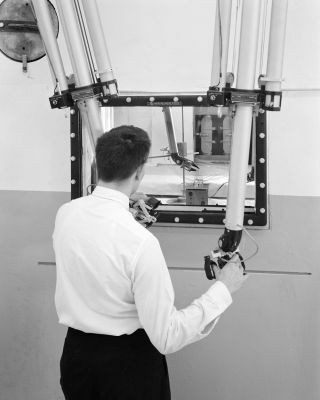 In this historical 1961 photo from the U.S. space agency, Bob Oldrieve, a hot laboratory supervisor, uses manipulator arms to inspect radioactive materials within a hot cell. The pliers-type "hand" is visible inside the window. Operators became so skillful in operating the manipulators that some were even able to thread a needle with them.